The modern environmental crisis is a wake-up call for fundamental change and innovative ideas. Apiarist Michael Thiele will be joining us to discuss ways to draw inspiration from the natural behaviors of honeybees. 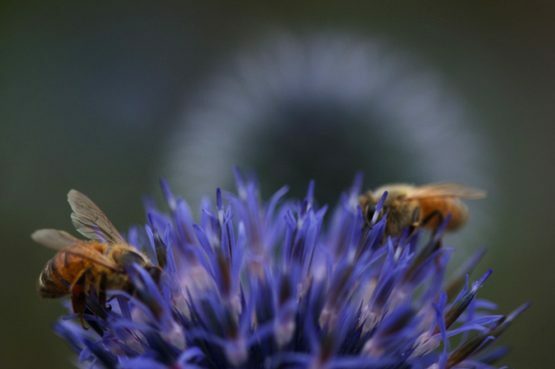 These life-giving pollinators are not only a keystone species, they’re cultural innovators too. Michael’s beekeeping vision restores complex ecological systems and draws on bees’ instinctual wisdom to create more resilient pollinator communities. In this presentation, Michael will introduce his “Apis Arborea” beekeeping project. He’ll be giving examples from current projects and sharing the craft of traditional tree apiculture. He will also discuss beekeeping strategies that value the bees’ well-being and natural instincts. Michael Thiele is an apiarist with over twenty years’ experience in creating honeybee sanctuaries and refuges. He founded the organization Apis Arborea to advance biodynamic apiculture and has taught beekeeping around the world. Michael has presented his work at Harvard University, appeared in national magazines, books, and films, and has consulted for the USDA. He lives in Northern California with his family and countless honeybees.